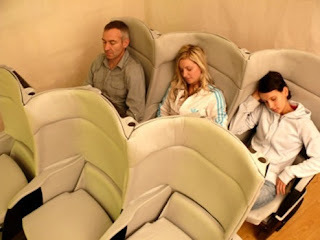 "Cozy Suite" Airline Seats - Friendlier skies for everyone! It's fun to ooh and ahh at the luxurious accommodations that the top 1% can enjoy ("First Class Cabin," anyone?) but more can be done for the goodness of humanity by making coach seats a little comfier. Thankfully, Thompson Solutions is on the right track with their "Cozy Suite," in which staggered seats offer both increased privacy and a place to rest your head other than the shoulder of the dude next to ya. It just makes sense, not to have peoples' squared shoulders taking up all the width of a narrow plane! This is just one of many cases where moving past the easy-to-engineer rectilinear default layout can open designers' eyes to what's really best for the user. I hope to see myself in one of these seats soon! Great design, I'm all for more space on a plane. I would have removable fabric on the head area so that germs and infestations of lice wouldn't spread from passenger to passenger.